In the Age of Social Media, we all know how important the power of reach is. INXPO is a webcasting company that prides themselves in just that, their “Power to Reach.” Through the use of their next generation webcasting product, INXPO successfully helps businesses communicate better with their customers, employees, partners and prospects. The lucky winner was (drum-roll please….) JEFF HEISLER! Jeff is an Account Executive and INXPO who likes beer and clearly, sales. We think this event is genius. A lot of sales oriented businesses encourage silent competition that fosters a cut-throat environment and ends up turning employees against one another, INXPO is clearly different. The Top Gun Prospecting Email Challenge is a perfect example of how friendly internal competition can help all of the employees in a company grow, while simultaneously benefiting the clients who use their services. We love INXPO’s next generation approach to business, and are honored that they used Far Out Awards to be a part of such a great initiative; if they think this creatively to foster growth inside the office, imagine what they can do for you! 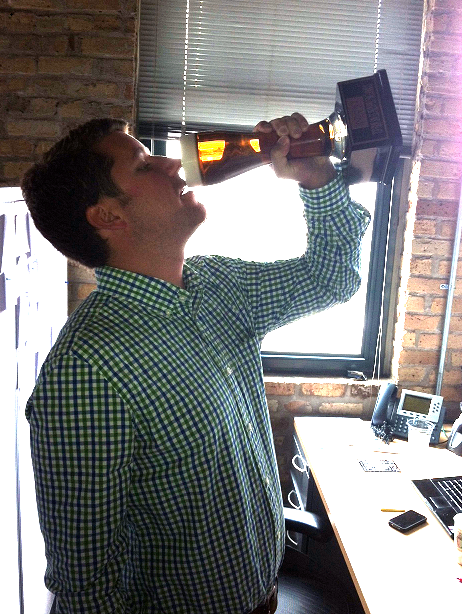 Heisler takes a “sip” of his Far Out Award, tasting his sweet success.